Lawrence Kane (26th April 1924 - May 20th 2010) has always been closely linked with the disappearance of Donna Lass, last seen at the Sahara Tahoe Hotel on September 6th 1970, on account of the fact he worked in the same building. One person who was convinced of Kane's guilt in the killings was that of Harvey Hines, a retired law enforcement officer, who noted a close comparison between the Zodiac letters and Lawrence Kane's handwriting, as well as whole host of circumstantial evidence he has compiled down the years. In 1992, according to Harvey Hines, Kathleen Johns claimed her assailant that night was none other than Lawrence Kane, chosen from a six picture line up. In the prelude to these events, Larry Kane suffered a brain injury to his left frontal lobe in 1962 after a serious car crash in San Mateo, California. Doctors diagnosed an inability to control his urges for self-gratification and was subsequently arrested several times as a 'peeping Tom' in the preceding months running up to the first confirmed Zodiac attack on Betty Lou Jensen and David Faraday on December 20th 1968 in an isolated turnout alongside Lake Herman Road. He would have had a rudimentary knowledge of coding after his brief time in the United States Naval reserves in 1943. So, along with the Modesto abduction of Kathleen Johns and the Donna Lass disappearance at South Lake Tahoe, did Larry Kane have the means and opportunity to commit the five murders at four locations attributed to the Zodiac Killer. 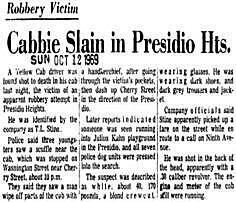 Paul Stine, the Zodiac Killer's final confirmed victim had arrived for work at the Yellow Cab Company at 8.45 pm, taking a fare from Pier 64 to the San Francisco Air Terminal. His most likely route thereafter was US Route 101, taking him back to the busy theater district at the Mason and Geary Street intersection, where he probably felt he was likely to pick up an unscheduled fare. At this point, the assistant traffic manager of the Yellow Cab Co, Leroy Sweet, instructed Paul Stine of a regular pick-up at 500 9th Avenue. This was the last contact with Paul Stine just prior to his fateful last journey to the corner of Washington and Cherry at 9.55 pm, where he was mercilessly gunned down execution style to the right side of his head. ​Lawrence Kane, it was claimed, lived a 217 Eddy Street at the time of the Paul Stine murder. This location is less than a quarter of a mile from the Mason and Geary intersection, the presumed pick up point of Zodiac on October 11th 1969. ​Donna Lass worked as a Staff Nurse at the Letterman General Hospital in the Presidio park, before she eventually moved to South Lake Tahoe in June 1970, as did Lawrence Kane. Both (according to Harvey Hines) ended up working at the Sahara Tahoe Hotel. ​Donna Ann Lass (25) worked as a private nurse prior to traveling to San Francisco, where she set up residence at 4122 Balboa Street. The Letterman General Hospital in the north of the Presidio was the last known direction the Zodiac Killer was seen traveling after the murder of Paul Stine. However, her employment at the Letterman General Hospital was short lived, spanning February 1970 to May 1970, before she took a job at the Sahara Tahoe Hotel and Casino on June 6th 1970. She initially moved in with a couple, Larry and Ann Lowe, before renting her own apartment at 3893 Pioneer Trail at the beginning of September. Six days later she would go missing. Lawrence Kane's address in South Lake Tahoe was 408 Mcfaul Way, Round Hill Village, Zephyr Cove, Nevada. ​Harvey Hines goes on to say that according to the Nevada Division of Real Estate, Lawrence Kane moved to Las Vegas in 1971 and was resident at the La Fonda Apartments on Spring Mountain Road. In early 1971, the Zodiac letters would cease for nearly three years until the 'Exorcist' letter arrived on January 29th 1974. Dana Lull was abducted from her vehicle on April 24th 1974 from Red Rock Canyon in Las Vegas, her body later discovered in a mine shaft on Mountain Springs Road, San Bernardino, California. Her companion Roy Tophigh, who survived the attack, would give a description to police that closely matched Lawrence Kane. He also described the assailant's vehicle as a white sports car (possibly a 1966-68 Triumph Convertible), black cloth top, wire spoked wheels, chrome luggage rack on trunk, missing grill and "old" California licence plates. Lawrence Kane at the time owned a white 1966 MG sports car convertible, black cloth top, wire spoked wheels, chrome luggage rack on the trunk, missing grill, old California plates (TDY274). Roy Tophigh would later recall he saw the killer in the Spring Inn one month after the attack, a place supposedly frequented by Lawrence Kane according to his previous employer. 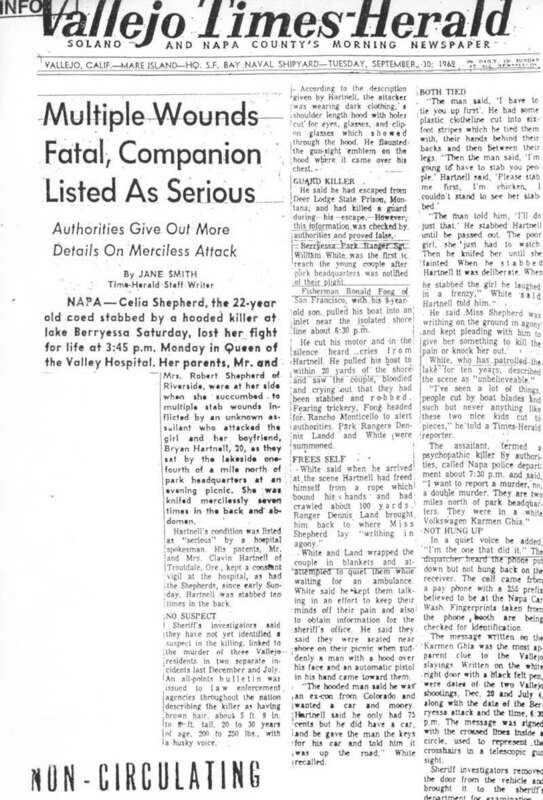 On August 8th 1974 The Reno Gazette ran an article "Murder probed in Vegas. LAS VEGAS (AP) -Nevada and California officials say they are investigating if a young man indicted for kidnap and attempted murder in Arizona had any connection to the unsolved murder of a Las Vegas girl. There are similarities in the cases, said police officials in Las Vegas and sheriff's officers in San Bernardino County in California." The area that Dana Lull was found is 68 miles from the location of the Cheri Jo Bates murder, an early crime forever connected to the Zodiac Killer. ​There are a lot more circumstantial elements drawing Larry Kane into the fold of the known credible suspect list, but this does not make Lawrence Kane the Zodiac, it simply makes him a suspect worthy of consideration. The '13 Symbol' cipher. Click to visit page. Harvey Hines examined the Pines postcard for indicators, believing that the punch-hole in the top right corner of the image may have indicated the likely burial site of Donna Lass, or at least reveal key information. It was in this area by the Sierra Club that lay a configuration of 13 stones formed into a cross (see below). It was discovered by Otto Fredericks while out hiking in 1976, and revealed to Hines several years later. 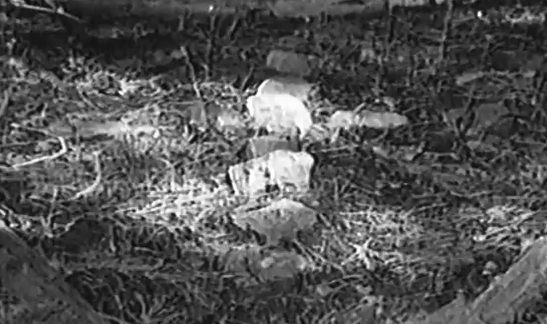 Harvey Hines contacted Zodiac expert Dave Peterson and work soon began to excavate the site for clues, but no remains were found, only a pair of women's sunglasses. Lawrence Kane, Hines's main suspect was questioned by police, but through a lack of evidence no charges were ever filed against him. Here are two interesting snippets from the Harvey Hines 120 page report on Lawrence Kane. The first indicates a call was placed by the Zodiac Killer from a public payphone in Union Square, San Francisco. The second features a unique image of the Pines Card created by Harvey Hines and photographs of the crucifix stone formation at the Sierra Club. "Now, according to John Miles, I find that Kane lived at 217 Eddy Street in San Francisco prior to his moving to South Lake Tahoe. In looking at an area map of San Francisco, I found 217 Eddy Street appeared to be only about two to three blocks from where Paul Stine picked up the Zodiac on October 11th 1969. I then called inspector Dave Toschi at the San Francisco Police Department and got more details on the Stine killing. Toschi said they had determined the killer had called for a cab using the public payphone located at Union Square. Toschi said the cab picked the killer up and drove to the corner of Washington and Cherry Streets. At this point the cab driver was shot in the head. The killer was then seen by three witnesses from a residence nearby, wiping down the cab. Apparently wiping away fingerprints. Toschi said he also cut away a portion of Stine's bloodied shirt. After doing this, he calmly walked away in the direction of the Presidio Army Installation. 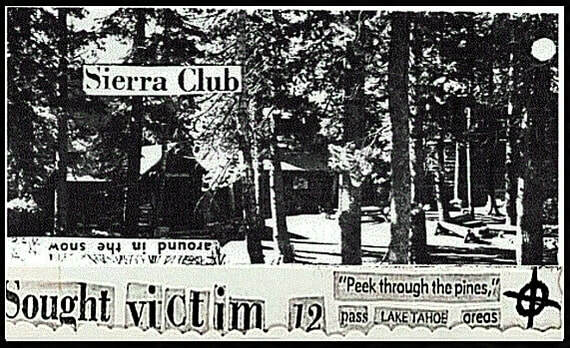 Harvey Hines went on to elaborate about his search for Donna Lass, in particular the 'Pines' card mailed on March 22nd 1971: "After studying the card, I drove to Nordin, located on old Highway 40, north of Lake Tahoe, and found the SIERRA CLUB. I learned the club was not called the Sierra Club. It was named the Claire Tappan Lodge and it was a private club for Sierra Club members only. I believed if I followed the directions on the postcard I would find Donna Lass' grave. I believe she was buried near the Sierra Club and most likely on the Donner Ski Ranch. I would later have the pictures of the Sierra Club developed. Then using a copy of Zodiac's card, I cut out the phrases he had pasted on his card. Using these phrases, I overpasted them on the copy of the Sierra Club picture. It was striking similar to the original card."